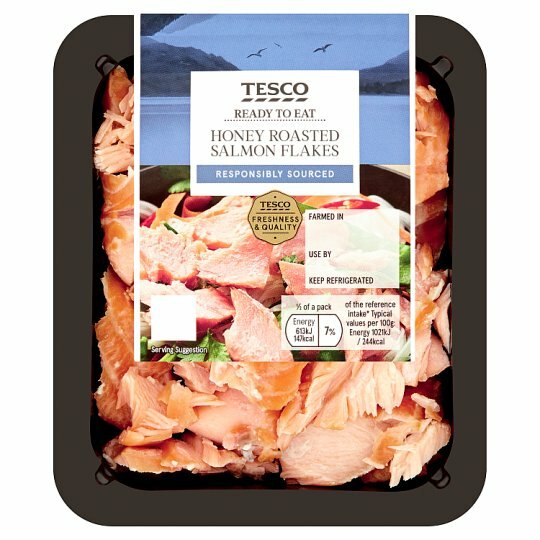 Hot smoked salmon (Salmo salar) flakes with honey. Gently smoked, lightly roasted and glazed for a sweet, smoky flavour. Responsibly sourced from waters off the coast of Norway or Scotland. Glazed and gently kiln smoked using oak for a robust flavour. Can be enjoyed hot or cold. Responsibly sourcing our seafood is important to us, which is why Tesco fish experts work with responsibly managed farms and fisheries to continually improve their high standards of quality, welfare and sustainability. To enjoy this product at its best remove from fridge 5 minutes before serving. Caution: This product can contain minor bones..